Not to be confused with Deconstruction. Reconstruction was the attempt from 1863 to 1877 in American history to resolve the issues of the American Civil War, when both the Confederacy and slavery were destroyed and the Constitution was expanded by three amendments that strengthened the rights of citizens. 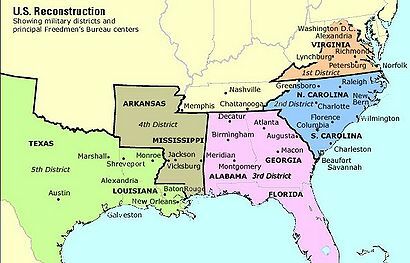 Reconstruction addressed the return of the Southern states that had seceded, the status of ex-Confederate leaders, and the Constitutional and legal status of the African-American Freedmen (newly freed ex-slaves). Violent controversy arose over how to accomplish those tasks, and by the mid 1870s Reconstruction had failed to equally integrate the Freedmen into the legal, political, economic and social system. "Reconstruction" is also the common textbook name for the entire national history during 1865 to 1877. Reconstruction came in three phases. Presidential Reconstruction 1863-66 was controlled by Presidents Abraham Lincoln and Andrew Johnson, with the goal of speedily reuniting the country. Their moderate programs were opposed by the Radical Republicans, a political faction that gained power after the 1866 elections and began Radical Reconstruction, 1866-1873 emphasizing civil rights and voting rights for the Freedmen. A Republican coalition of Freedmen, Carpetbaggers and Scalawags controlled most of the southern states. In the so-called Redemption, 1873-77, white supremacist Southern Democrats (calling themselves "Redeemers") defeated the Republicans and took control of each southern state, marking the end of Reconstruction. There were conflicting theories of what the national government could and should do to restore the South to a normal status. The key constitutional provision was the national government must guarantee to every state a "republican form of government." Exactly what that meant was the issue. Radical Republican Charles Sumner argued that secession had destroyed statehood alone but the Constitution still extended its authority and its protection over individuals, as in the territories. Thaddeus Stevens and his followers viewed secession as having left the states in a status like newly conquered territory. Congress rejected Johnson's argument that he had the war power to decide what to do, since the war was now over. Congress decided it had the primary authority to decide because the Constitution said the Congress had to guarantee each state a republican form of government; the issue became how the core political values of republicanism should operate in the South. President Abraham Lincoln was the leader of the moderate Republicans and wanted to speed up Reconstruction and reunite the nation as soon as possible. Lincoln formally began Reconstruction in late 1863 with his Ten percent plan, which went into operation in several states but which Radicals opposed. Lincoln vetoed the Radical plan, the Wade-Davis Bill of 1864. The opposing faction of Radical Republicans were much more skeptical of Southern intentions and demanded far more stringent federal action. Congressman Thaddeus Stevens and Senator Charles Sumner led the Radical Republicans. After Lincoln's assassination, President Andrew Johnson switched from the Radical to the moderate camp. He too favored voting rights for the 170,000 black veterans. Republican leaders agreed that slavery and the Slave Power had to be permanently destroyed, and that all forms of Confederate nationalism had to be suppressed. Moderates said this could be easily accomplished as soon as Confederate armies surrendered and the Southern states repealed secession and ratified the 13th Amendment (which abolished slavery); all of which happened by September 1865, when Johnson felt Reconstruction was finished. By 1866, however, Johnson, with no party affiliation, broke with the moderate Republicans and aligned himself more with the Democrats who opposed equality and the Fourteenth Amendment. Radicals attacked the policies of Johnson, especially his veto of the Civil Rights Bill for the Freedmen. The House elections of 1866 decisively changed the balance of power, giving the Radicals control of Congress and enough votes to overcome Johnson's vetoes and even to impeach him. Johnson was acquitted by one vote, but he remained almost powerless regarding Reconstruction policy. Radicals used the Army to take over the South and give the vote to black men, and they took the vote away from an estimated 10,000 or 15,000 white men who had been Confederate officials or senior officers. The Radical stage lasted for varying lengths in the different states, where a Republican coalition of Freedmen, Scalawags, and Carpetbaggers took control and promoted modernization through railroads and public schools. They were charged with corruption by their Southern Democrat opponents, calling themselves "Redeemers" after 1870. Violence sponsored by the Democrat-founded Ku Klux Klan was overcome by federal intervention. By 1877, however, Redeemers regained control of every state, and President Rutherford Hayes withdrew federal troops, causing the collapse of the remaining three Republican state governments. The 13th, 14th, and 15th amendments were permanent legacies. Bitterness from the heated partisanship of the era lasted well into the 20th century. See Reconstruction historiography for a much longer guide and an explanation of how historians have tackled the topic. Walter Lynwood Fleming The Sequel of Appomattox, A Chronicle of the Reunion of the States(1918). Dunning School. Ford, Lacy K., ed. A Companion to the Civil War and Reconstruction. Blackwell, 2005. 518 pp. Jenkins, Wilbert L. Climbing up to Glory: A Short History of African Americans during the Civil War and Reconstruction. SR Books, 2002. 285 pp. Perman, Michael. Emancipation and Reconstruction (2003). 144 pp. Rhodes, James G. History of the United States from the Compromise of 1850 to the McKinley-Bryan Campaign of 1896. Volume: 6. (1920). 1865-72; Highly detailed narrative by Pulitzer prize winner; argues was a political disaster because it violated the rights of white Southerners. Lynch, John R. The Facts of Reconstruction. (1913)Full text online. Memoir by black congressmen from Mississippi during Reconstruction. McPherson, Edward, ed. The Political History of the United States of America During the Period of Reconstruction (1875), large collection of speeches and primary documents, 1865-1870, complete text online. Stalcup, Brenda. ed. Reconstruction: Opposing Viewpoints (Greenhaven Press: 1995). Primary documents from opposing viewpoints. This page was last modified on 26 September 2018, at 14:28. This page has been accessed 38,019 times.